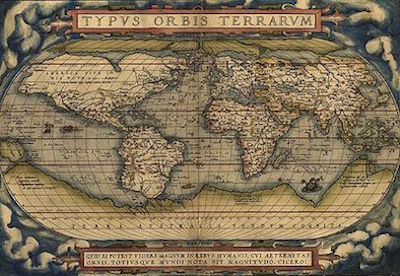 Map: Exploring The World, edited by Rosie Pickles and Tim Cooke, features 300 maps from the past 3,000 years, including works by acclaimed cartographers such as Abraham Ortelius, Gerard Mercator, Andreas Cellarius, and Joan Blaeu. The maps are "organized in complementary or contrasting pairs," with 200-word descriptions, and a detailed chronology provides historical context. The book includes not only realistic cartographic maps, but also illustrated examples, such as an 1877 map depicting Russia as a giant octopus, its tentacles reaching out into Europe (Serio-Comic War Map, by Frederick W Rose; based on an 1870 design by JJ van Brederode). James Gillray's personification of England as George III excreting onto France (A New Map Of England & France, 1793) is equally satirical. Maps by artists are also included, as are infographics such as Joseph Minard's representation of Napoleon's Russian campaign (1861). 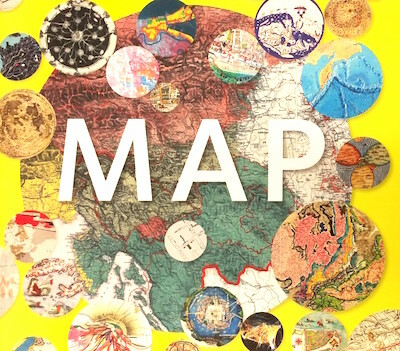 Map follows the same format as The Fashion Book, The Art Book, The Photography Book, The Pot Book, and The 20th Century Art Book, also published by Phaidon. It includes useful biographies of key cartographers, though the bibliography is limited to very recent publications. The Story Of Maps, by Lloyd A Brown, was the first guide to cartographic history. Leo Bagrow's History Of Cartography (revised by RA Skelton) is the most comprehensive single-volume history of the subject. The History Of Cartography, a multi-volume work edited by David Woodward, is the definitive global survey of cartography.